The new UR110 from Promag is a reliable reader for contactless data capture in an attractive design. Use the UR110 for applications in security access control environments, as well as for user identification. It can read at up to a distance of 9 cm. Its wide operating voltage between 7.5 and 12 volts simplifies operation in many systems. Thanks to its compact footprint, it integrates simply into any surrounding. Its weatherproof casing allows it to be installed outdoors as well with an operating temperature range of -10C to 60C, or in extreme work areas, without any problems. Choose from various interfaces according to your requirements Wiegand, Magstripe, RS-232 or RS485. In addition to perfect performance, this device will also impress you with its high degree of flexibility with individually changeable casing. 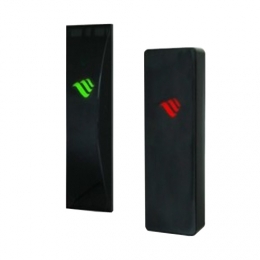 To meet the wide range of applications in security access areas, it comes with a customised logo, LED lights in six different colours for reading and stand-by modes, as well as configurable buzzers. Its attractive piano finish tops off the elegant design.